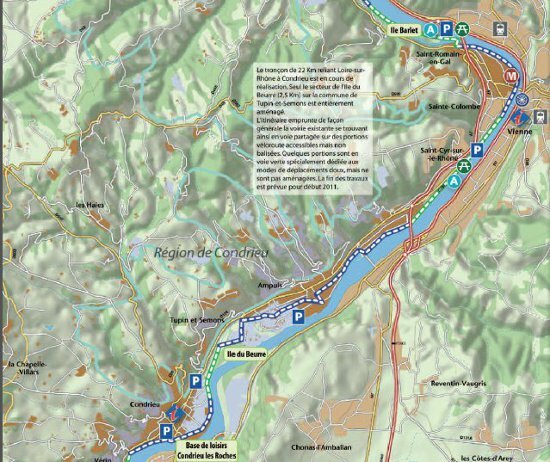 This is the name of this path that meander, eventually, in the Rhone Valley of 650 kilometers across three regions and 12 departments. 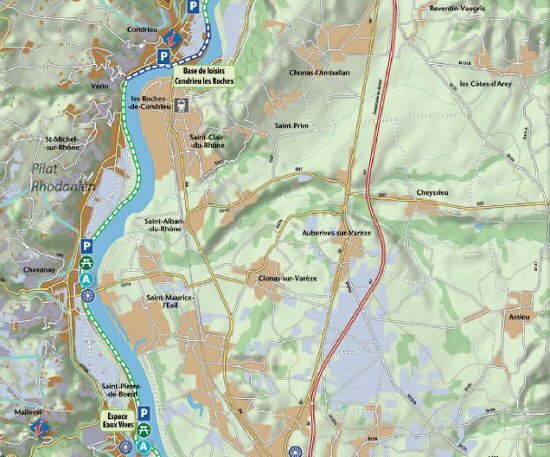 Hyphen between the Alps and the Mediterranean, ViaRhôna can already find some of the banks of the Rhone, a river approaching exceptional heritage and discover the neighboring territories. She invites us to re discover especially a founding elements of our identity and reveals the richness and originality of the Rhone culture. Practice quietly reserved for soft modes of travel and accessible to disabled people. The opportunity to walk along the banks of the Rhône river bike, rollerblades, scooters or on foot. From here you can quickly reach three successive courses. This section allows you to boot from an exceptional site with its rich history. St Romain en Gal has the most beautiful Roman relics on several acres on which the museum was built to exhibit the wealth. It has a wonderful collection of mosaic and a single restoration workshop it. ViaRhôna go down the front of the Vienna Antique or are Temple, Amphitheater, Obelix, Roman road and many other riches. In St. Colombes come find you burn in stone parapet of the trace of the ropes that the 18-19th century harness horses pulled the boats up on Lyon. (Former towpath) . Condrieu you will stop to visit the visitation "old convent" or the house of the salt tax opposite the church. And if you have a little time cross the bridge over the Rhone to visit charming pace of boats and barges that sway peacefully in the Port des Roches de Condrieu. Near the village church is worth a visit as it has a fine collection of colorful works of the painter Der Markarian and the testimony of the life of mariners. Return on Condrieu the only bridge admire the strength of the river, check flood heights parked on the scales ... and ask you to taste this nectar so fresh so tasty ... what Condrieu (in moderation of course). Continue ViaRhôna Verin, St Michel sur Rhône another hilltop village on the hills above the vineyards. Here hardly anyone remembers but the August 31, 1944 thanks to the courage of a few men of the time has been avoided a second Ouradour on catfish . While you will come down to Chavanay, you will find the traditional pool of exchange games and sports mecca among youth in the region. Rhone Villages competing annually in the right mood (accompanied by local band) the coveted trophy champion France jousting. In the vineyard it is here that starts the appelation of St Joseph, cousin of Côte Rôtie. Finally and enjoy nature so different from the valley to 150 m and the foothills of Mont Pilat over 1400 meters, you pourrz admire the valley of Montélier ravine carved into the hillside and having a unique flora and fauna. You can see the nesting areas of the Grand Duke of Europe. If the moment of time, you want to swap your bike for a canoe is in St Pierre de Boeuf space Whitewater need to stop . 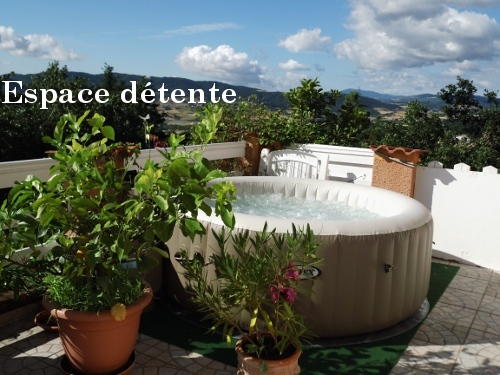 Artificial river and leisure for a refreshing adventure. Try canoeing on lake or rafting, kayaking and the whitewater swimming. After the emotions you want to dive back into the wild run to the meandering Ovest, Sensitive Natural Area is a haven of tranquility where only the singing animals come to us tickle the ears. European Bee-eater and insects occupy the grassland during the summer. While living the pond are easily observable that knows how to be discreet. Known as "Little Venice" promenade Sablons opens widely on the charm of the old Rhone and bathed in light reflections that fueled the inspiration of the Cubist painter Albert Gleizes. Its foundation is built at the dock in an old house hauling the seventeenth century (Moly Sabatal). The ViaRhôna passes and leads to the lock or ballet barges and is a repetitive show. 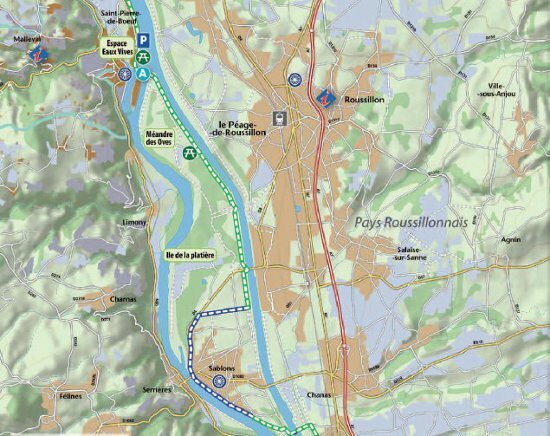 Stroll along the old towpath now converted into walk along the quays bordering the wild Rhone. Opposite the village of Serrières houses the Museum of sailors and dock batelleries. Then look carefully you will find the church and the old walled mummies found ....! Good luck towards the Mediterranean.